Meanwhile we've unshared the projects temporary, you can submit to our newsletter and we will let you know once the projects are back online , or simply keep visiting this page. Please share this page in your Facebook with others (that's the minimum you can do in return) , thanks a lot. 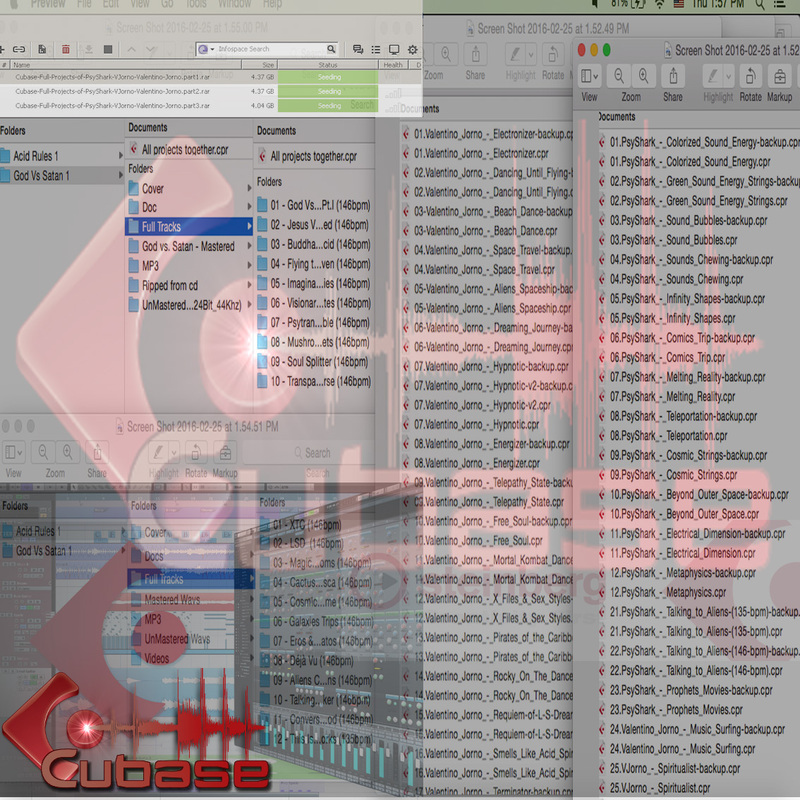 Free Download 77 Cubase Full Projects of PsyTrance & Uplifting Trance by PsyShark , VJorno , Valentino Jorno. it's a huge pack of 20GB total folders zipped into 12GB, consisted of 3 torrents parts for download. Included also many unique Psy presets for different Vst's prepared by PsyShark, each project/track has a folder of it's own presets. Use those projects for educational or inspirational purpose only, learn how to construct a new track by analysing the projects and having new ideas that could help you complete your projects too. But please don't copy the tracks neither release/sell them because that's not the idea of sharing them with you for free. By analysing the projects, studying them deeply, then it can save for you lots of time and help you becoming a better producer. But , for sure this "shortcut" will not replace the need of working hard, so you need to practice always if you want to become a professional producer, all the idea here is saving for you money that you might pay for sound schools or private lessons while all you need is to see how a complete track looks like inside, so here you have best opportunity to see , not only 1project/track, but 77 projects/tracks , which make this one of the best packs that any producer can get, it takes you directly into the final products, but in addition you can watch PsyShark tutorials in youtube for extra knowledge and tips. All rights of those projects with all their content are reserved to Valentino Jorno. Those projects are provided to public for educational or inspirational purpose only, copying or any commercial use is not allowed. For full copyrights notes list click at: Terms and Conditions.